I had some precious time on my hands this summer so I made a few more liquid-metal prints in my Alhambra series. 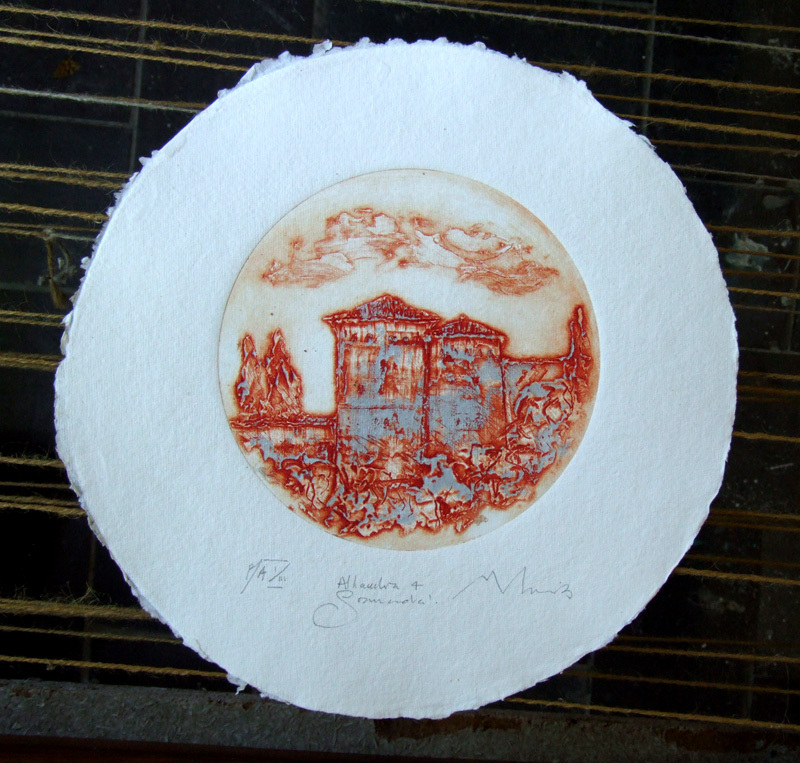 During the time I was working on them Carmen Vargas, a friend from Almería, came by my studio and we spent a couple of days printing up her most recent plates. Carmen brought with her a round piece of plexiglas she had found in a tip. (Most good artists are tip rats!) “Here,” she said. “See what you can do with that.” After Carmen went home I continued with my own prints. That round piece of plexiglas was still laying where she left it. “Shall I make a round liquid-metal print? Why not?” So I made one, printed a couple of proofs and left them on the pile. A couple of days later I was on the phone ordering some etching paper from Totenart in Valencia and César, the friendly, efficient sales person there said, “We’ve got this handmade paper in a round format with a deckle edge all around. Would you like to try it?” As it turned out, that round paper was the perfect match for my round plexiglas plate. That’s the story of this print. Interesting approach Maureen. I see you keep the same colours I think that is a good idea.